Y’ALL! I am so excited about this new Gucci bag I picked up recently. 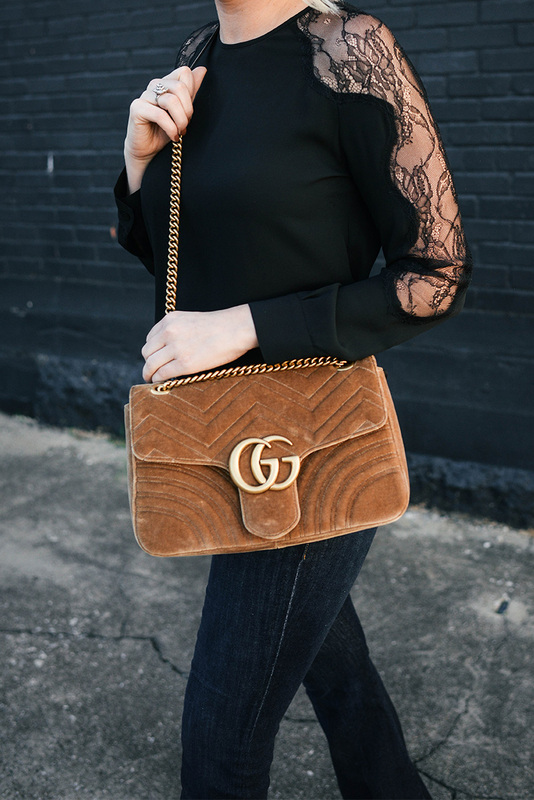 It’s such a gorgeous camel color and the velvet is on point for the fall/winter season, don’t you think? 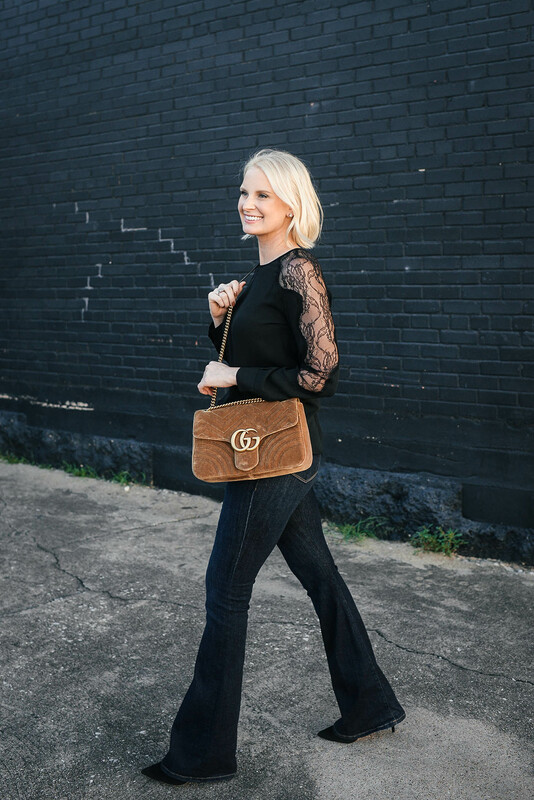 I love the long chain strap and how it allows me to wear the bag as a crossbody or shoulder bag. So versatile and useful! Like this look but want something smaller? This camel velvet look also comes in this wallet-on-a-chain style! Perfect day-to-night crossbody/clutch. If you’re looking to invest in a quality handbag for fall/winter, Nordstrom has so many good pieces right now. 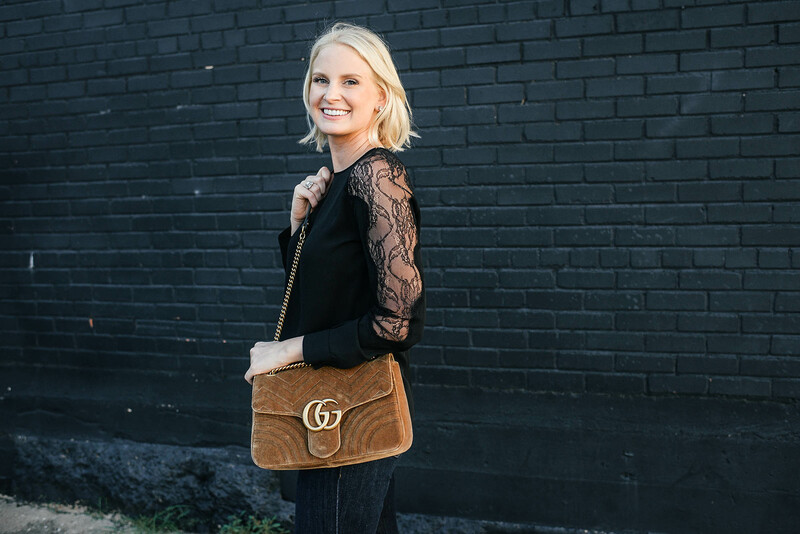 A few other velvet favorites include this small velvet crossbody (the gold bar detail is fab! 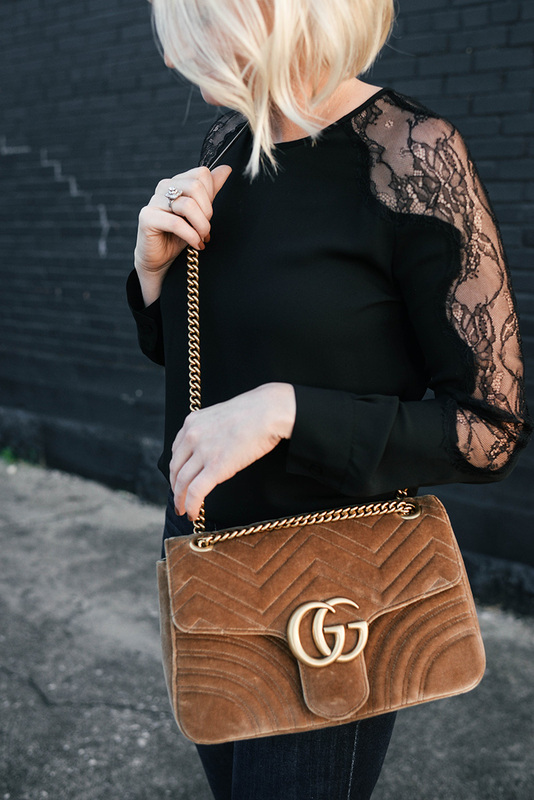 ), this Saint Laurent crossbody, or go nuts with a gorgeous holiday style like this! Want the velvet look for less? Don’t miss this little tote. Too cute! My jeans you’ve seen before as I’ve had them for a couple years now (such a great fit and fall wash! ), but this blouse is new and won’t do much damage to your wallet! It’s under $70 and comes in three other gorgeous fall colors. I chose black because I wanted the option to style it with all kinds of bottoms and colors. The lace detail is only on the shoulders and down the sleeves, so I think this top could probably be a good work shirt for some of you who work in more casual offices! Such a pretty top at a wonderful price point. This double-breasted camel coat is under $200 and a beautiful winter wardrobe staple! 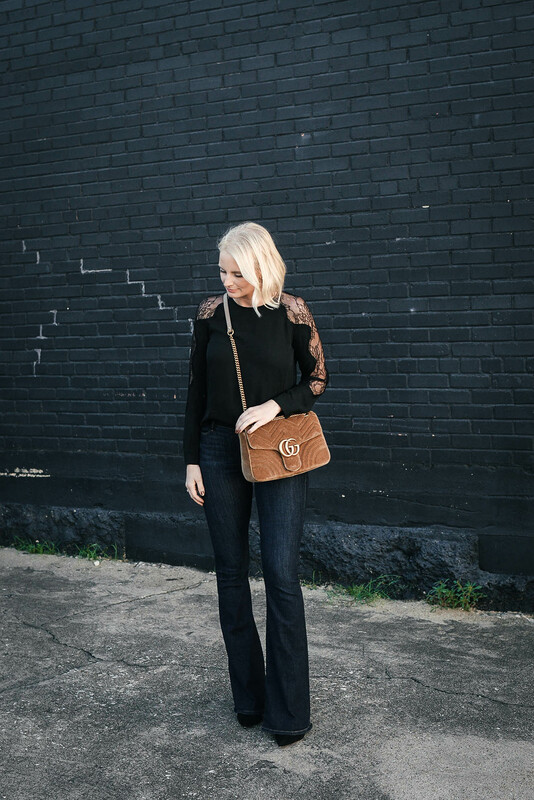 Loooove these velvet skinny jeans in cognac. Such a great color! Looking for a good fall plaid blazer under $100? Don’t miss this. This black coat is a splurge, but look at that ruffle hem!!! I die. I may or may not have ordered these cognac boots last week… hope they fit! Take a page out of Meghan Markle’s bottle green notebook with this gorgeous leather jacket. This under $100 velvet dress reminds me of one I have from last year! Great for going out, date night and holiday parties! This under $90 cashmere sweater is such a cute and cozy everyday style. love this top and your new do. That lacey top is gorgeous!! And love love love your Gucci bag! such a great outfit! Love the bag too! Wow, that’s a pretty outfit! Of course, you look gorgeous!